This tutorial will show you how to build a Piccolo interface. It will cover how to use the default nodes, how to create new nodes through composition and how to create new nodes using inheritance. The first line adds the base Piccolo types, such as PNode. The second line includes the basic event types. The third line includes the default node types that Piccolo provides, all of which extend PNode. The fourth line includes several utility classes. 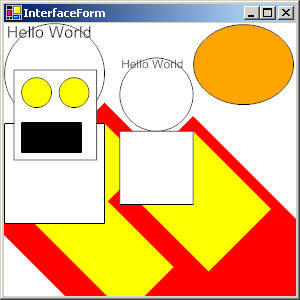 And the last line includes various "extras," such as PForm in .NET and PFrame in Java, which will be used below. 2. Add a Drag Event Handler. Now lets define some interaction for the nodes that we will add below. By default, the pan and zoom event handlers are installed. We will remove the pan event handler and add a drag event handler instead so that the individual nodes can be dragged around. Add the following lines of code to the initialize method. // so that we can drag the nodes around individually. Now we will add a few nodes to the interface. In addition to PNode, Piccolo comes with three basic types of nodes (PPath, PText and PImage), plus a few in the extras package. We will add each of the basic types below. First we will use PNode directly. PNode is a concrete class and can be added to the scene. By default, a PNode will just fill its bounds with its brush. Add the following lines of code to the initialize method. // A node will not be visible until its bounds and brush are set. // A node needs to be a descendent of the root to be displayed. // A node can have child nodes added to it. // of a node will not affect its children. // transform all of its children as well. // of a node will not affect it's children. This snippet illustrates how to create a node and add it to the scene. Typically you will add nodes to the main layer. It also shows that there are two ways to affect the position and size of a node, by changing its bounds or its transform. The first approach does not affect the node's children, while the second does. You can think of modifying a node's transform as defining a new coordinate system for that node and all of its children. PNode itself is not very interesting. So, lets try some more advanced nodes. Add the following lines of code to the initialize method. // Add a couple of PPath nodes and a PText node. // of the root node. Then we add the new PImage to the main layer. In the first two lines, we add a couple of path nodes. PPath represents a general path. You can create arbitrary paths by adding line segments and arcs or you can use one of the static CreateXXX methods to create a common shape. The Pen property in .NET and the setStroke() and setStrokePaint() methods in java define how the edge of a path is drawn, while the Brush property in .NET and the setPaint() method in Java will define how the path is filled. Next, we add a text node. PText is a multi-line text node that will wrap its text based on the width of the node's bounds. Finally, we add an image node. PImage wraps an image so that it can be added to the Piccolo hierarchy. Above, we take advantage of the PNode.ToImage() method, which can be used to get a thumbnail of any node. The real power of Piccolo is the ability to make new kinds of interface components. There are various way to make new types of nodes. Here we will examine how to create new nodes by combining several pre-existing nodes together. We will create a face node by adding the eyes and mouth as the children of another node. Add the following lines of code to the initialize method. // Create parts for the face. // Add the face parts. // Don't want anyone grabbing out our eye's. // Position the face parts. // Set the face bounds so that it neatly contains the face parts. // Opps its to small, so scale it up. // Opps its too small, so scale it up. This works because of the hierarchical nature of Piccolo. However, by default any node is pickable. "Picking" refers to the process that determines which node is under the mouse cursor. Events will be dispatched to the picked node and passed to each ancestor that also intersects that point (see the Defining User Interaction tutorial). Typically event handlers will modify the picked node in some way. For example the drag event handler, will move the picked node, which means that the children can be dragged around without moving the parent. In this case, we only want to be able to drag the face as whole. So we make the face's children not pickable. This means if you click on an eye, the face will be picked instead. The drag event handler moves the picked node by modifying its transform so the eyes and the mouth will also be moved. Of course, the ultimate creative control comes from extending the existing node types to create new kinds of nodes. Here we will use inheritance to build a new kind of node. We will create a new node that will draw itself as an ellipse by default and as a rectangle when the mouse is pressed over the node. We will implement this class by extending PPath so we don't have to create the ellipse code from scratch. For an example of how you could create an ellipse node from scratch see the Creating Nodes Pattern. Add the following internal class beneath the initialize method. In the constructor we use the PPath to create the ellipse. We store the fIsPressed field to indicate whether or not the mouse is currently down over the node. Notice that the set accessor for fIsPressed sets the value and then calls InvalidatePaint(). This method notifies the framework that the node needs to be repainted. Piccolo will then invalidate the child paint of all the ancestors of this node. Later the screen damage will be collected for all the nodes with invalid paint and eventually the Paint() method of those nodes will get called. Notice that we override the Paint() method to modify how the node will be drawn when it is repainted. When fIsPressed is true, we will fill the bounds of the node. Otherwise, we will just use the base implementation, which will only fill the ellipse. Finally, we also use event handlers to set fIsPressed to true when the mouse is down over the node, and back to false, when the mouse is released. For more about events, see the Defining User Interaction tutorial. Now that we've created the new type, we have to actually add the node to the interface. Add the following lines of code to the initialize method.